"This is a simple recipe that was given to me by my mother. She served it when I was a child, and my family of 6 loves it too. Serve on hamburger buns." Heat a large skillet over medium-high heat. Cook and stir beef in the hot skillet until browned and crumbly, 5 to 7 minutes; drain and discard grease. Mix ketchup, chili sauce, brown sugar, Parmesan cheese, relish, onion, and Worcestershire sauce into ground beef; simmer until heated through and flavors blend, 20 to 25 minutes. This is a really easy recipe and the sweet pickle relish adds another dimension. Next time I will cut back the brown sugar to 1/4 cup. It was a bit on the sweet side. 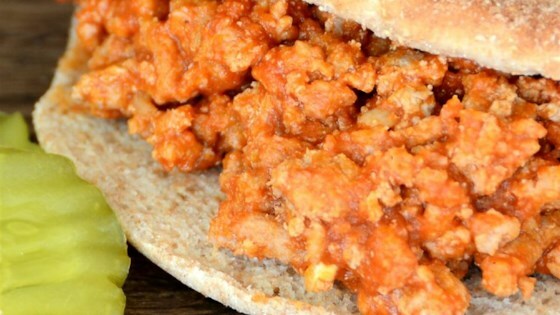 I love this sloppy joe I just add a little more pickle relish. I have made this several times and everybody that eats it loves it. OMG this was so yummy!! !I loved it!!! Made this for grandkids they loved it asked that I make it again and I will. I added 1/2 c. of sweet baby rays BBQ sauce. This might be our new favorite way to make sloppy joes. Like the other reviewers, I reduced the brown sugar to 1/4 c. I used ground turkey and it was delicious!